I know everyone is anxious to get their hands on Blizzard’s next money make, Diablo 3, but we have to remember not to lose our common sense when we see a suspicious email show up in our inbox’s. 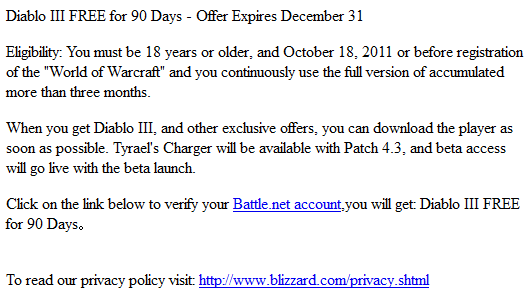 Starting sometime this month are a round emails that seemly come from Blizzard, offering you access to Diablo 3free for 90 days… However they aren’t from Blizzard and are the latest scam to steal your Blizzard account from you. If you happen to see an email like the one show below, please hover your mouse cursor over the “Battle.net account” link to verify that is legit or not as I can definitely tell you that in this cause they are not legit. DON’T CLICK IT! DON’T CLICK IT! DON’T CLICK IT! We don’t want to you lose your entire Battle.net account simply cause you weren’t using your head!